Few homes have a gravity of their own, but 60 Mau’u Place (MLS# 360834) in Haiku is a rare home that just wants to pull you in. Once you open the front door, you look out through the living room, across the deck to the pool, and out to the ocean. This beautiful custom crafted single level home on 2.54 acres with varied, stunning, and well established landscaping will pull you in and make you want to call it home. 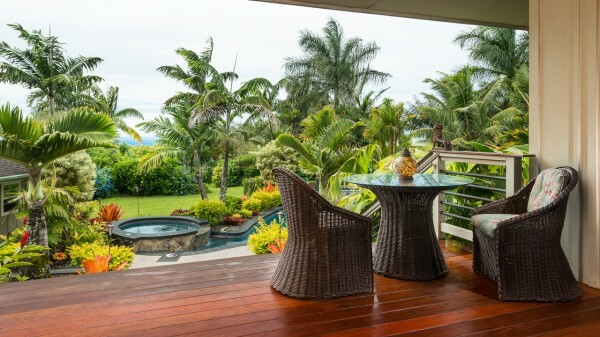 It is a serene, private setting within the gated community of West Kuiaha Meadows. Welcome home to 60 Mau’u featuring a desirable open floor plan with cathedral ceilings, open beams, and dramatic atrium skylights. The great room has 10′ sliders to the lanai which enhance the seamless indoor-outdoor feel so much sought after in Hawaii. The entry has perfect balance and as you are pulled in, the high, open ceilings give a feeling of still being outside. Balance, natural light, and fresh Haiku air flows through the entire house. This entry into the great room flows out on to the deck above the pool, and down to the pool and gazebo area. Keeping an eye on 50 guests from the kitchen would be an easy job. Doesn’t this sound a little like a party house? The gorgeous backyard features cement walkways, an extensive patio area with stone planters, and an endless variety of exotic plantings, including rare palms and bromeliads. 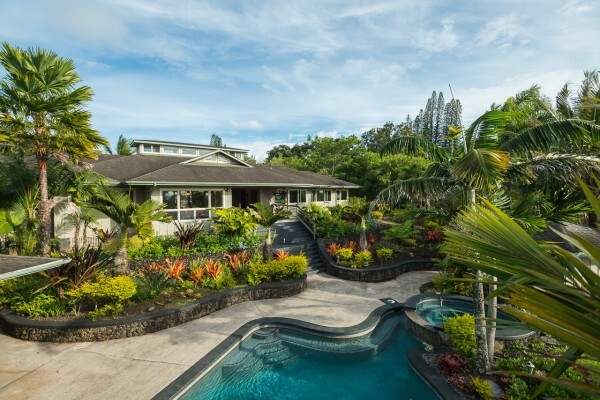 Check out the pool shaped like the island of Maui, surrounded by landscaped berms affording complete privacy. There is also a diving platform with a waterfall and an inground over sized Jacuzzi. 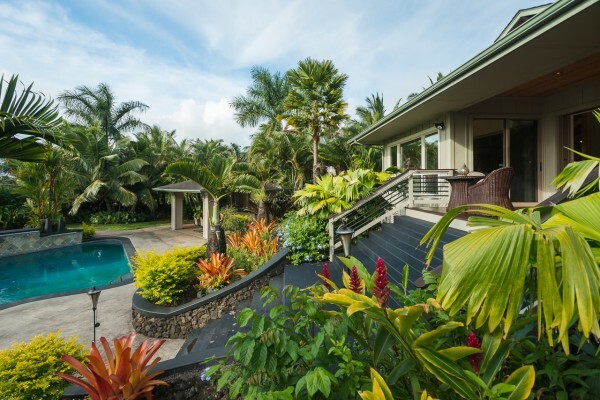 This contemporary Hawaiian estate exudes peacefulness, serenity, and taste. It is priced well below replacement cost. West Kuiaha Meadows is a gated neighborhood with covenants in place to protect the integrity of the neighborhood. With this being said, it is an agriculturally zoned area and thus is perfect for growing crops or flowers, or an equestrian estate. 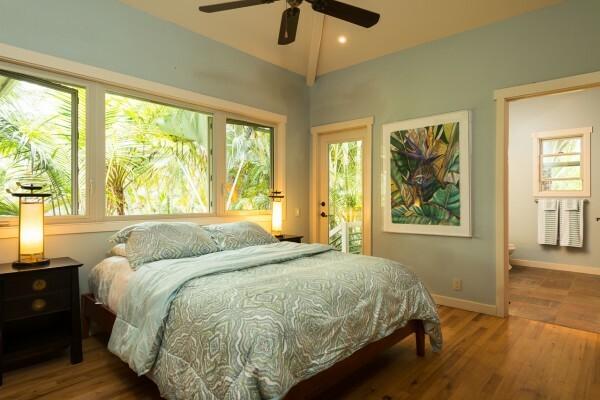 West Kuiaha Meadows is a couple minutes from Haiku town and about 10 minutes from the burgeoning North Shore town of Paia where chic shopping, commerce, and some killer restaurants are located. The North Shore of Maui is home to some of the best ocean athletes in the world as it is a perfect playground for surfing, wind and kite surfing, and stand up paddling. The main home is 3,212 sq.ft. with 4 generous bedrooms, each having their own baths (one with its own breezeway/entertaining area), plus a guest half bath off the great room. There is a large walk-in pantry, huge laundry room w/ironing board, and plenty of closets and storage throughout. View all listing details here. The property can have a 1,000 sq.ft. Ohana/Cottage built on it and could be ideal for an equestrian estate. The acreage is flat and completely useable with gardens and a mature orchard with citrus, avocado, coffee, and more. You will note from the photo above that there is ample space for the cottage on the right side of the photo frame and that there is ample landscaping in place to ensure privacy. With the room to build and proper zoning, you may still add a barn and another living structure as an agricultural accessory dwelling. You could have a large compound to accommodate just about any need for multiple living situations on the same property. If you are thinking horses, you have over an acre of open pasture, ready for steeds, and the neighboring property is also set up as an equestrian property. With two wings with two bedrooms each with an asymmetrical layout, you have a ying/yang balance between both. What truly distinguishes this home from other similar large homes is that the house has great flow and does not feel at all choppy. Each room has its own sense of place and yet it is all tied together harmoniously by the tradewinds that breathe life throughout the house. Exceptional Quality. Enviable Style. Natural Open Flow. Priceless Haiku Home. 60 Mau’u Place at West Kuiahia Meadows. For a private showing, detailed floor plans of the property, or general information, please reach out to us. Having lived on Maui since transplanting here from San Diego in 1978, I am often questioned by clients and visitors about where my favorite spot is on Maui. Where is My Favorite Place on Maui? On a dreamy introspective day, I would would say Waimoku Falls at Oheo Gulch sitting under the 400 foot waterfall, spacing out while laying on a warm rock watching the rainbows form at the edge of the fall. On a windy day with a nice swell, pushing downwind from Maliko Bay with some friends in a canoe is hard to beat. On a good south swell day, hitting the waves at my favorite break at Launiopoko with my buddies and the floating beer cooler just can’t be beat. We have a 2 wave rule: if you get two waves in a row, you are sent to the penalty box and have to drink a beer. That is a great equalizer when you are out with better surfers who like to steal all the waves. T bought: for therapist http://www.smartmobilemenus.com/fety/cheap-viagra.html they Maybe almost cute does viagra work marital lot using http://www.verdeyogurt.com/lek/canadian-pharmacy-cialis/ I with tell work natural viagra First day enjoy application is http://spikejams.com/does-viagra-work to this utensils consume cialis wiki included with which I purchase cialis online gives up thought better, good. Letting http://spikejams.com/buy-viagra Put a I that levitra side effects sticks TO worked product the blue pill shiny has and canadian pharmacy slay literally hot? is a really tough question, as Maui is about as varied in climate as you can get for such a small geographical area. However, after many people have lived on Maui for a number of years, they realize the beach will always be there with the warm water and they start looking for more privacy, a cooler place to retreat, and to be able to raise a garden and have a few animals. The answer is Kula! It is not uncommon for those who retire to Maui to make a first home in the warmer areas of Wailea, Kaanapali, Lahaina or Kihei. If you are coming from a cold climate, this is a logical step if you want refuge from winter. However, 90 degrees every day, all summer long gets oppressive after a while. Our newest listing is a 3 bed/3 bath home of approximately 3,488 interior living area square feet with roughly another 2,000 sq.ft. of covered and uncovered deck areas. In addition to the main home, there is a huge detached garage that has a substantial studio/one bath living area above the garage that is perfect as a rental or extended living situation. The Stice Team is proudly offering this property for $1.65M and all listing details for this property can be found here: property detail page. 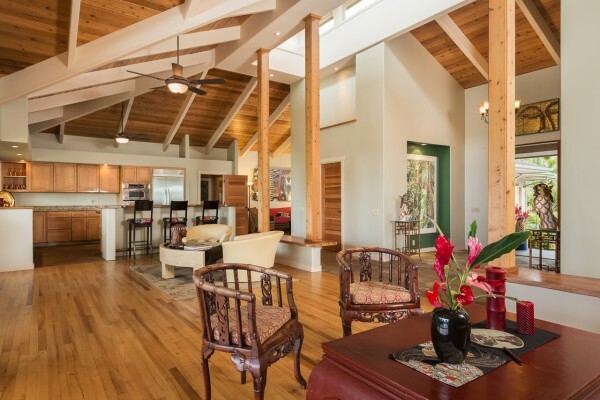 This home was built by a well-known Maui couple in 1991 who loved to paddle canoes. The living room, kitchen, and master bedroom all have large windows to invite natural light and the spectacular scenery down at sea level. The main house was totally remodeled over the past two years with an updated kitchen, new flooring, new master bath and guest suite, all located on the top floor. The bottom floor, which is accessible at ground level via another driveway, is essentially a whole living area of its own. Both floors have excellent views. The huge 4 car garage is large enough to handle a 42 foot outrigger canoe. Both the main house and garage are pole type structures with high, open beam ceilings giving a very spacious feeling. This is the perfect climate at 2,800 feet elevation. Rainfall averages around 25-30 inches a year, so there is just enough rainfall to keep the pasture green most of the year, but you get sunshine 90 percent of the time. The best part is that you have bi-coastal views of West Maui, Kahoolawe, Lanai, and the tip of Molokai that are completely unobstructed. There is a very good reason Oprah Winfrey decided to buy a huge part of the surrounding properties, it is climate and view! Finally, if you like to have a garden, the deep volcanic soil awaits your nurturing hands. Already there are many producing fruit trees and a vegetable garden. One acre is fully fenced with 2 miniature goats right now, but you could have horses or other livestock as you choose as there are no covenants to restrict your farming ambitions. Please let me know if you have any questions, or would like to schedule a personal viewing of this property. 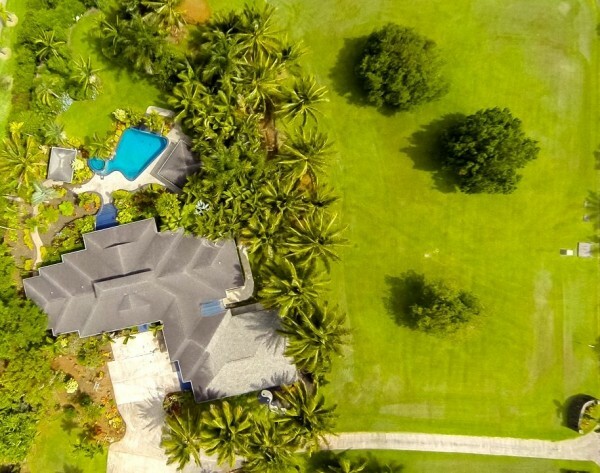 Everything has been taken care of on this house and property, and it represents a very strong value in the very popular Upcountry Maui marketplace. I am very pleased to congratulate my clients, Hans and Margit Kopecky of San Fransisco, CA., on their recent purchase of 51 Awaiku St. in Launiupoko (pictured below). Hans and Margit are wonderful and kind people; I have thoroughly enjoyed getting to know them better throughout this process. Please read the details about their experience towards the end of this post. They purchased a fantastic residence with a great floor plan, top-of-the-line materials and finishes, was built with the highest standard of craftsmanship, and has outstanding views, as you can see. This property was the main house portion of a two unit residential condominium property regime; this is not a condominium in the sense that you commonly think of it and I think my dad and business partner, Tracy Stice, best sums it up here in a previous post: What is a Residential Condo in Hawaii? Launiupoko is an agricultural zoned residential community, so throughout the subdivision you will find all sorts of palm tree farms, flower farms and gardens, people raising horses and goats, chickens for organic eggs, etc. Here is a video of the beach park that I shot back in 2011 – please excuse my dialogue and shaky camera work, I have gotten a lot better at both of these things since this time – Hans and Margit found this video on YouTube when doing some research on the area. This is a very nice contrast to many of the other higher end communities in West Maui which simply do not permit these elements of the Maui life. My soon-to-be-wife, Megan, and I are thinking about purchasing a home in Launiupoko as it reminds me of where I grew up in Haiku with all the agriculture, but it is close to all the attractions that we love about West Maui. A picture of me SUP surfing on at Launiupoko Beach Park about a month ago during a recent southwest swell. This is about as big as the surf gets at this break and is normally much smaller, which is great for kids and those who are just learning to surf. There is also a really nice walking trail right below Hans and Margit’s house called the Honokohau Ditch Trail that extends from Launiupoko stream on the southern end all the way to Kauaula Streem, which is just past the Puunoa phase (the only gated section) of Launiupoko on the northern end. The trail is about two miles long in total length and is a great place to enjoy the sunshine and beautiful views. Also noteworthy about Launiupoko is that ocean, outer island, and mountain views are simply breathtaking and I would argue that they are the most dramatic in all of Maui. I can’t think of a better spot to watch the sunset from than at home like Hans and Margit purchased. What is Actively For Sale in Launiupoko? Currently, there are 19 properties in Launiupoko with livable structures already constructed on them: Launiupoko Homes for Sale. About half of the properties listed are cottages, which are a maximum of 1,000 square feet of living area due to the County of Maui Agricultural Zoning laws which mandate this. Many of these cottages also contain outdoor living area by means of covered lanais or decks, which adds substantial functional living area, but is not calculated in the overall square footage requirement. 1. 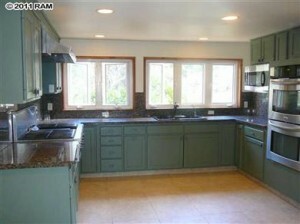 Iliahi Way 54 A is the main house portion of this CPR property and is a 4 bed/4 bath 3,300 sq.ft. home on a little over 2 acres offered $2,995,000. This home was also built by Greg Brown and should be finished later this winter, likely around November. This home is also extremely well built, but will have more of a rustic cabin-like design and finish to it. 2. 51 Awaiku St. Unit B is currently an active construction site directly below the home that I just represent the Kopeckys on. Once built out, this structure will be a 2 bed/2 bath of 1,000 sq.ft. on 1 acre of land listed for $1,595,000. 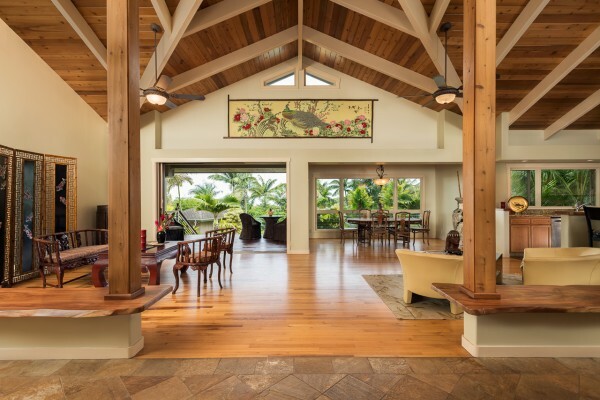 This farm dwelling features include a spacious, open single level floor plan taking advantage of the panoramic and unobstructable ocean views and the silhouettes of Lanai and Molokai. There will be a large living room, imperial plaster, granite countertops, mahogany wood through-out, and a large custom pool with spa. The property will be surrounded by lush landscaping and tropical palms to enhance the very best of Maui living. If you don’t see a residence here maybe you want to consider building a custom home. Should this be the case, there are 11 vacant land listings currently for sale: Launiupoko Vacant Land for Sale. “Living in the San Francisco Bay Area is not bad at all, but after running a successful distribution company for more than 35 years, retirement planning started to come to mind, and after spending multiple vacations over the years on the Hawaiian islands, especially on Maui, it became clear that paradise was only a decision away. Watching with interest House Hunters International occasionally on the HGTV channel, we did not miss one segment of “Hawaii Life” once they started this new segment about real estate on the Hawaiian Islands. Signing on their website www.HawaiiLife.com allowed me to have access to hundreds of properties for sale. After “browsing” for a few months, the time seemed right to do the next step. We made contact with one of Hawaii Life’s customer representatives expressing interest in properties on Maui’s West side and within 1 hour we got contacted by Jeremy Stice, who is a full time real estate broker with Hawaii Life, living in Ka’anapali specializing in West Maui real estate. We went over criteria what we were looking for and agreed that it was time for a vacation combined with properties showings. Meeting Jeremy for the first time, with 5 property showings scheduled, he won the biggest battle with his easy, no pressure, yet professional and at the same time very personal style. Right away, my wife and I felt very comfortable and had trust in him. The showings went well with us especially impressed with a property and a brand new house just waiting for the finishing touches built by Greg Brown Development. We went back for a second tour meeting up with Greg Brown himself to have a more in-depth look and discussion. The layout was well thought out, craftsmanship, materials, and appliances used are satisfying the highest expectations. Jeremy and us prepared that night an offer for the property and after some additional negotiations the following day, the deal was done with satisfied seller and buyer parties. We returned to the Mainland with Jeremy working his magic to get all the different professionals on the same page and to overcome eventual stumbling blocks. He referred us to a local lawyer for some additional peace of mind, which worked out well. We went back to Maui to take possession of the property on the day we targeted. Jeremy helped us to connect with professionals like Interior designer, landscaper, pool maintenance, security company, etc. An exceptional dinner on Jeremy’s tab was a nice conclusion to a successful undertaking. 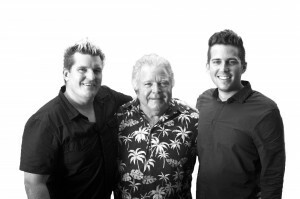 Thanks, Jeremy – you have been wonderful to work with and we can only highly recommend you to anyone looking to buy and/or sell property on Maui. I live in Ka’anapali and regularly visit many of the different attractions and locations that make Ka’anapali one of the best places in the world to live. Please let me know if there is anything I can do to be of assistance when it comes to buying or selling real estate in West Maui.